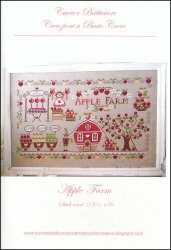 Apple Farm [w6039] - $13.44 : Yarn Tree, Your wholesale source for cross stitch supplies. Cross stitch pattern by Cuore e Batticuore. A apple farm with freshly picked apples of all kinds and a stand selling candied apples. Stitch count 250 x 156. Stitched on #8291 Belfast Linen light mocha.